A student on the MA Interactive Journalism programme at City University London has been given a prestigious award by the Sports Journalists' Association. Mark Critchley was presented with the David Welch Student Sportswriter Award at a ceremony in London on Monday 23rd March. 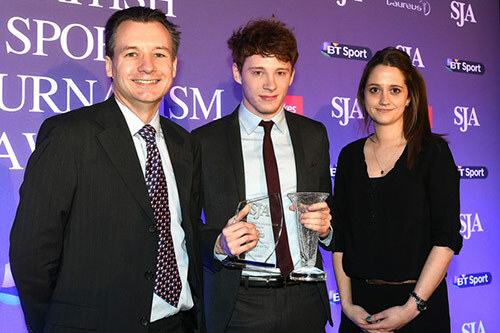 BBC Sport journalist and City alumnus James Gheerbrant, who completed the MA Newspaper Journalism course in 2014, also won the Young Sports Writer category. Mark's main areas of interest are football, boxing and darts, with the Manchester Evening News and Vice magazine among the titles that have published his work. His winning submissions for the award included a live blog of a darts match, a top ten of great sports commentary moments and an interview with John Sitton, a former Leyton Orient manager. This is just one of many awards that City students and graduates have won for journalism this year. Mark, who is originally from Chorley in Lancashire, said: "Sports journalism is an incredibly difficult environment to survive in for young aspiring writers. Everyone wants to get into it. "It was mentioned in passing at the ceremony last night that Des Lynam's autobiography is called 'I Should Have Been At Work'. That's an apt title because covering the world's greatest sport occasions is more of a privilege than a 'job'. "This award is confirmation from those within the industry that I am on the right track and, by working hard and pushing myself further, I can one day earn a living writing about what I love. I'm delighted to have won it." Mark will be acknowledged in the Daily Telegraph, have one of his submissions published on the newspaper's website and be offered a week’s work experience. Tom Felle, Acting Director of Interactive and Newspaper Journalism at City, said: “We are delighted that Mark and James have been honoured by the Sports Journalists' Association, this truly is an honour for both of them. This is just one of many awards that City students and graduates have won for journalism this year.